two part light sculpture **note** the lamp shade is a solid part and requires "Spiralize the outer contour" to be selected in Cura or other slicing software. Shell: .8mm or you may want to try 1.2mm for a tight fit. 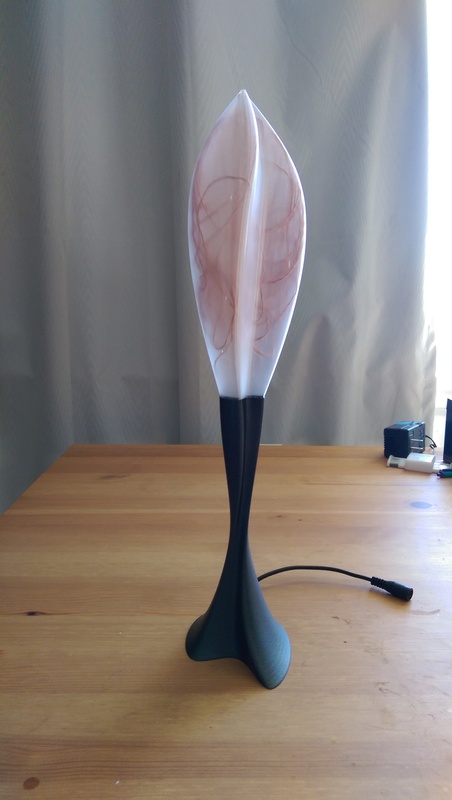 the lamp shade is a solid part and requires "Spiralize the outer contour" to be selected in Cura or other slicing software. Use a brim but be careful not to damage the bottom when removing it. Construction: Top spiralized in MatterControl 1.6 (1.5's spiralize function is broken) and printed in T-Glase with 0.1mm layer height. Bottom printed in black PLA with 0.1mm layer height and 30% infill and then sanded down smooth and painted with 3 coats of Rustoleum universal flat soft iron and one coat of Valspare flat matte top-coat. Closed the top of the spiral and joined the base and top with Testors clear parts cement. Finish: The picture doesn't do justice to how good it looks in person.